Talk about some serious bragging rights these runners are attempting to earn. 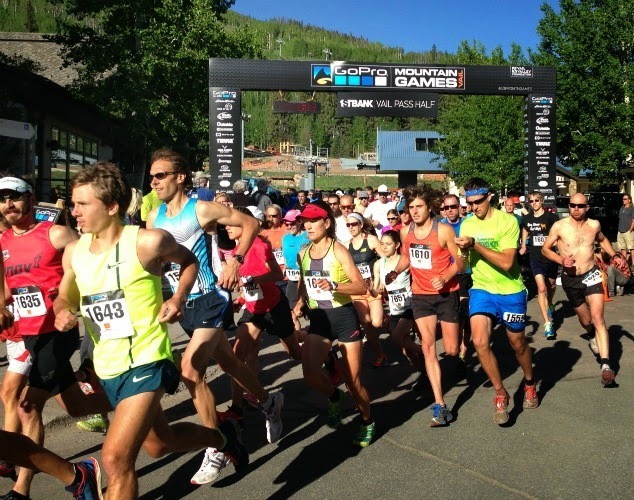 They're just steps into the Vail Pass Half Marathon, one of the three running-centered events--the Badass Dash and the Spring Run-off are the others--that takes place during the GoPro Mountain Games, held at Vail from June 5 to 8, 2014. With a name like the Vail Pass Half Marathon, you'd be correct if you guessed runners would be running (or walking, stumbling, dragging their legs, etc.) up Vail Pass, whose summit is roughly 13 miles east of the Golden Peak start line. I wonder if all of these runners knew what they were getting into when they signed up? They must have. This isn't your average half marathon after all. After what feels like a flat start, according to my husband who ran it last year and admits he took it out way too fast as a result, you're running up up up to finish at the top of Vail Pass, gaining roughly 2,900 feet. Your finish line is 13.7 miles away, 0.6 miles more than you'd run in most other races labeled half marathons. That mileage isn't even guaranteed: Race organizers state that you could run more or less than that 13.7 if the route, a popular mixed-use paved trail that weaves past the Vail golf course, through East Vail, and under Interstate 70, still has snow on it (and with the above-average snowpack we've heard reported from this season, that's totally possible). And who knows? It even could be snowing at the summit depending on what Mother Nature has in store--though taking the gamble today was a winning decision because it's picture perfect. Has it really been a year since we were up in Vail for the GoPro Mountain Games? Yep. But it sure doesn't feel like it. It's sunny, warm, still a little snowy in spots, and I'm adjusting to the elevation and keeping an aching back from flaring up, just like last year.